Laamouz Stops Mukhamadiyarov as New Stars Farrugia and Brown Shine. 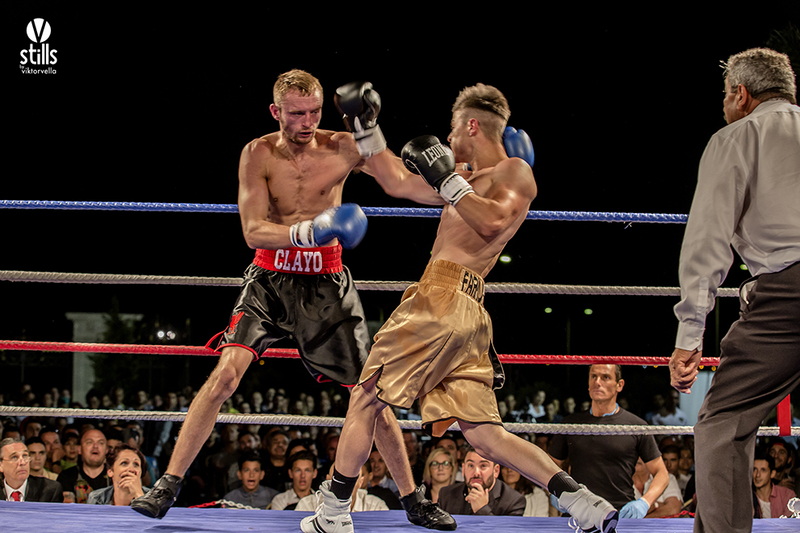 On Friday night, in the grounds of the incredibly beautiful Monte Kristo Estates in Hal Luqa, Malta, local boxing fans were treated to a magnificent night of International boxing. The event, which was headlined by the MBC International Heavyweight title clash between Malta’s very own ‘King’ Billy Corito and the big hitting (18 KO’s from 27 wins) Latvian Edgars Kalnars, was the first event from new promoters Steve Carauna and Mark Calleja, along with a little help from experienced British promoter Stephen Vaughan. Right from the opening bell Corito went straight on the attack, landing a big right to the head, Kalnars stood his ground and shot out a strong jab, only to receive another big right hand that connected flush. What followed next was a controlled exchange between both protagonists that had many of the highly vocal fans on their feet and cheering on their man. After a fairly frenetic start both fighters settled into a slower pace for the rest of the round. Round two was fought at a good pace, with both men exchanging big shots throughout. Without doubt both the first couple of rounds were fairly close, although surely could only be scored in favour of Corito due to him not only being the busier but also his shots showed way more intent, but the third was a totally different affair. Corito slowly ground his man down, forcing Kalnars back constantly with a series of powerful salvos, a number of which shook the big Latvian to the core, each time the local crowd became more vocal in encouraging their man to step up the attacks, which on some occasions he did much to the delight of the partisan crowd. More of the same from Corito in the fourth, however Kalnars seemed to have lost the will to go toe-to-toe, which made the round very much a one sided affair, with Kalnars covering up often and allowing Corito to let rip with big right hands. During one of the exchanges Kalnars seemed to be caught in the rib area and as he went to shoot out a right hand of his own let out a cry of pain, after which pulled his right arm across his chest and began to turn away from his forward advancing foe. Corito cautiously moved forward and looked toward referee Lee Murtagh for guidance on whether he should continue the attack or not on the stricken Latvian. Whilst a gentlemanly act from Corito, it almost cost him dear as Kalners turned and threw out a strong jab and looked set to throw a big right. Corito responded with another salvo of big rights and kept up the pressure until the end of the round. Coming out in the fifth Kalnars seemed sluggish and was breathing heavily, clearly in some form of discomfort, however Corito was not going to make the same mistake as in the previous round and once again began throwing big right hands at every conceivable opportunity. For virtually the whole round it was Corito walking his opponent down, throwing big right hands to head and body, then in the dying seconds of the round Corito stepped up the pressure once more. When the bell rang Corito turned and headed straight to his corner, however Kalnars appeared disoriented for a few seconds before finally heading back to his corner, referee Lee Murtagh showed some concern, as did MBC Chief Medical officer Dr Mark Xuereb, who immediately headed to Kalners’ corner and began checking over the distressed Latvian. As the minute break was coming to an end the referee stepped forward, as it was clear that Kalnars was in no position to continue and waved the bout off just as the opening bell for round six rang. Have to say I’ve seen Billy Corito in action a number of times, he’s always been good for the money, but this time he was magnificent. Credit in part must go to Corito’s coach, former WBU World Champion Shea Neary, who came up with a game plan that surprised most, gone were the big haymaker’s Corito is so well known for, instead Corito was controlled, good head movement and his punches were crisp, sharp and more importantly nearly always bang on target. Word is that Corito’s team were so impressed with his performance that discussions are already underway for a mouth watering showdown later this year with a certain big name British Heavyweight. The main support see Pieta, Malta’s Haithem Laamouz in action against Russia’s Ravil Mukhamadiyarov. 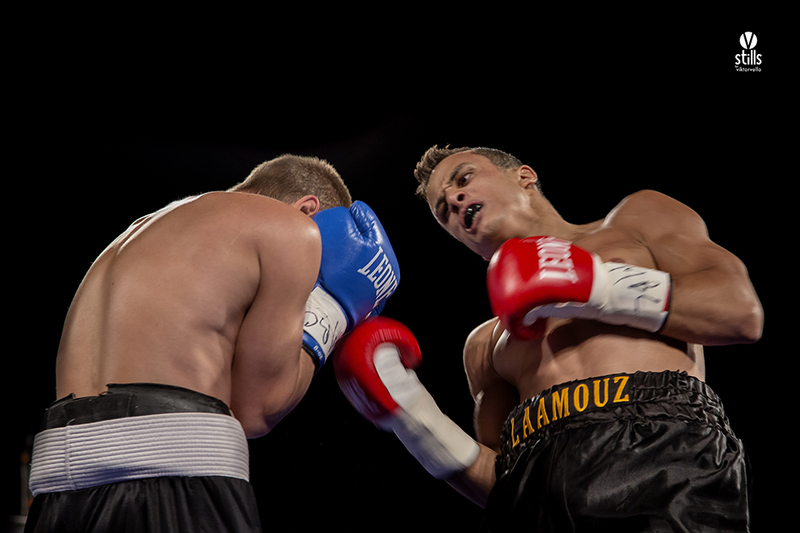 Laamouz took the fight to the more experienced Mukhamadiyarov right from the start and kept up the pressure throughout the first couple of rounds. Early on in the second Laamouz landed a cracking body shot that sent Mukhamadiyarov to the deck, as referee Lee Murtagh reached the 8 count surprisingly the tough Russian jumped to his feet. The plucky lad surprised most observers by making it to the end of the round despite Laamouz’s efforts to finish the fight early. From the third on the pressure from Laamouz was clearly proving too much for Mukhamadiyarov, the Russian covering up and only occasionally responding with an ineffective jab to keep the Maltese lad at bay. Early in the fifth round Laamouz backed Mukhamadiyarov onto the ropes and began a non-stop assault, until referee Lee Murtagh stepped in to save the Russian from further punishment on the one minute and thirty seven second mark. Supporting the pro bouts were a number of International Novice Pro and semi-pro bouts between local boxers and a team from the United Kingdom. The Novice Pro is a recently introduced division featuring boxers with limited amateur or unlicensed boxing experience but wishing to compete in the professional division. The Novice Pro division is operated under full professional boxing rules and with the same medical requirements as the professional division. The main differences between Novice Pro and Pro bouts are that, only Novice Pro licensed boxers can compete against another Novice Pro Licensed boxer and that the rounds are of two minute duration, not three as in the pro ranks. OK, so now that’s explained let’s get back to the action. 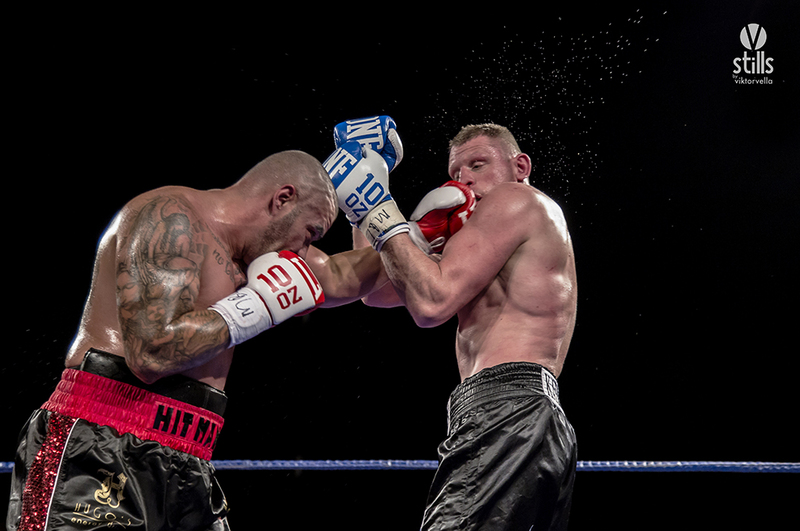 The final Novice Pro bout see Malta’s Malik Zinad against UK’s William O’Reilly in a six, two minute round contest for the vacant WBU Europe Novice Pro Light Heavyweight title. These two warriors went to war right from the opening bell, both giving their all for every single second of every round. In the fourth Zinad stepped up the pace, occasionally forcing O’Reilly onto his back foot, it was later during one of these forceful attacks that Zinad began letting rip with some mighty bombs, one of which was just a tad off target and the thumb of his glove accidently entered the eye socket of the English lad, no surprise that as it did O’Reilly let out a shocked scream of pain as he headed for the canvas. Dr Xuereb and his medical team were by the clearly distressed Englishman’s side in an instant, literally as referee Lee Murtagh waved the bout off. I’m pleased to say that I had spoken with William O’Reilly since and he is absolutely OK and there is no lasting damage to his eye. Prior to Zinad-O’Reilly was Malta’s Kerstin Brown against the UK’s Nathan Lavery, for the vacant WBU Europe Novice Pro Super Bantamweight title. Young Brown is definitely one to watch and judging on his performance on Friday night is destined to become a future star, think of a younger Carl Frampton and that’ll give you an idea of just how classy and exciting young Brown is. From start to finish the youngster controlled the bout like a seasoned pro, his ring craft was supreme, cutting off the ring to keep Lavery pinned against the ropes before closing in and letting rip with lightning fast double handed flurries. Nobody was surprised when the score cards were read out, a shutout 60-51 in favour of Brown, as he really dominated the bout from start to finish, outboxing his taller opponent in sensational fashion. 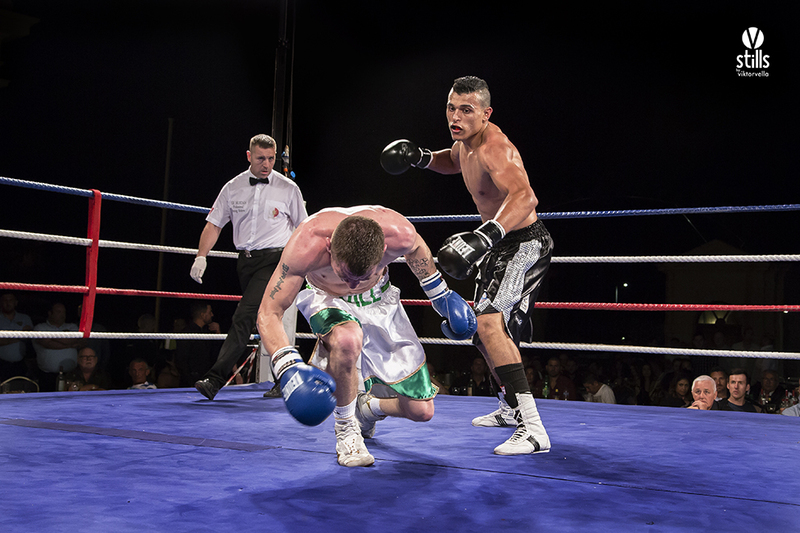 The first Novice Pro bout featured Malta’s Max Farrugia against the UK’s Lewis Burns in a four rounder. 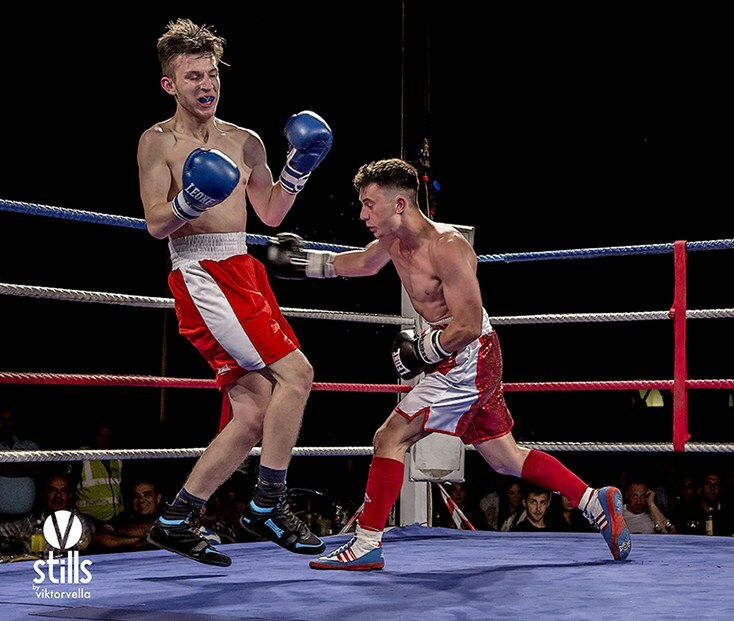 As with young Kerstin Brown, Farrugia is another emerging star, this kid has it all, think Junior Witter in his younger days, slick, switch boxing with so much panache it is mouth watering to watch. From start to finish Farrugia out boxed his tough opponent, at times he made it look too easy, but believe me it wasn’t as Burns is one tough cookie and gave his all for every second of every round, just Farrugia is a class act, one that will be a great addition to the pro ranks that’s for sure. After four sensational round the ringside judges scored the bout 40-36 (twice) and 40-37 in favour of the deserving Max Farrugia. What a cracking fight and as with the other Novice Pro bouts, easily equal in quality to the full pro bouts. Judges Scores – Majority Decision in favour of UK’s Jonathan Dean. Judges Scores – Split Decision in favour of Malta’s Goran Bogdanovic.